The CPO Honors dinner saw two highly-regarded Chief Procurement Officers inducted into the CPO Rising Hall of Fame while four other CPOs and their teams were presented awards for excellence in procurement. Ardent Partners, a leading industry analyst firm focused on supply management, hosted the “CPO Honors” Gala dinner during its annual CPO Rising Summit last week in Boston. The awards dinner, which capped off day one of the executive symposium, saw two highly-regarded Chief Procurement Officers (“CPOs”) inducted into the CPO Rising Hall of Fame; four other CPOs and their teams were presented with awards for excellence in procurement performance, technology, and innovation. The CPO Rising Hall of Fame was established to celebrate the career achievements of a select group of Chief Procurement Officers who have driven value from transformational thinking, next-generation strategies, and process excellence, while also possessing a dedication to the craft and investing their time and efforts in advancing the procurement profession. The Leadership Award (CPO of the Year): This award is presented to the CPO whose department has achieved new performance heights as a result of their direct involvement, leadership, and exceptional executive management. The 2017 winner of this award is Stephen Listzwan, head of procurement, Shire Pharmaceuticals. The Innovation Award: This award is presented to the CPO that has used new and innovative strategies and approaches to overcome significant hurdles. The 2017 winner of this award is Walter Charles III, CPO, Biogen. Best Team Performance Award: This award is presented to the procurement department that has excelled across the full scope of procurement operations to make a significant impact on overall enterprise results. The 2017 winner of this award is Stan Brown and his team, CA Technologies. The Technology Excellence Award: This award is presented to the team that has leveraged technology solutions to impact procurement operations and overall performance. The 2017 winner of this award is the “procurement team” at Boston Scientific. “For the past two years, we have been driving a transformation of our Indirect Sourcing Organization. In addition to aggressive cost savings objectives, we set out to build the capabilities of a World Class Sourcing Organization. Technology has played a key part in this transformation and enabled our team to more effective, efficient, and better serve our internal customers and suppliers,” said Tim Dolan, global director of indirect sourcing, Boston Scientific. 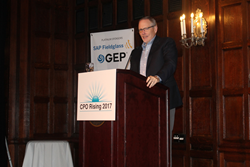 This CPO Honors Gala dinner was part of the CPO Rising 2017 Summit, which was sponsored by GEP, SAP Fieldglass, ZeroChaos, Coupa, SAP Ariba, EC Sourcing Group, Acquiire, iValua, Determine, and ScoutRFP. The CPO Rising Summit is an annual conference that brings together a select group of global CPOs and other procurement executives for an interactive two days filled with presentations, panel discussions, roundtables, and networking. The event is an opportunity for CPOs to meet with an exclusive set of like-minded peers and examine industry best practices, discuss innovation and the latest technology trends, network extensively, and challenge the status quo. For more information about the “CPO Honors” awards and the CPO Rising Summit, please visit http://events.cporising.com. Ardent Partners is a leading industry analyst firm focused on defining and advancing the supply management strategies, processes, and technologies that drive Best-in-Class performance and accelerate organizational transformation for procurement and finance departments. Ardent Partners’ analysts have decades of experience conducting and publishing primary research that helps leaders in procurement, supply management, and financial operations make smarter decisions and improve their performance. To learn more about the company, visit http://www.ardentpartners.com.